The same happened to Supriya Kaushik and Radhika Sharma who were roommates. Both of them were running high fever and didn’t want to take any chances. They decided to consult Dr Mayank Uppal, Consultant, General Medicine at Sitaram Bhartia Hospital for a proper diagnosis. Viral fever is an infection that is characterised by high fever, headaches and bodyches. It is quite common and usually isn’t a huge cause of concern. “In viral fever, the high temperature could be your body’s attempt to ward off the infection from your system. It is extremely common especially in children and aged people as they have weaker immunity” informs Dr Mayank during their consultation. What are the causes of viral fever? Viral fever is caused by a group of viral infections. “Unlike dengue which is mosquito-borne, viral infection can be airborne, waterborne or it can even be transferred from one person to another” explains Dr Mayank. 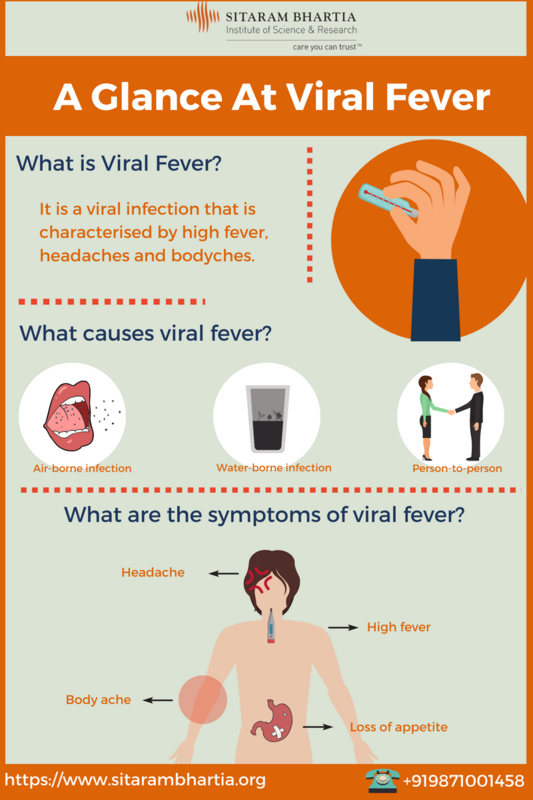 What are the symptoms of viral fever? After a medical check up, Supriya and Radhika were both advised a blood test, which they got done 24 hours after the fever. Anxious, they took their reports to Dr Mayank for a proper analysis. It turned out that Supriya was just down with viral fever. Radhika, on the other hand, was diagnosed with Dengue. It can last anywhere from 4 days to a week. Supriya was advised medicines, proper hydration and rest to recover from viral fever. The right medicines should be prescribed for the treatment of viral fever. If the fever is mild, you could avoid medicines after consulting your doctor. Radhika was prescribed medicines and guided on certain home care tips for dengue. Supriya’s temperature lowered in a few days and she recovered within a week. Radhika’s temperature fluctuated for a while before it finally fell and so it took her sometime to gain back her strength. This blog post has been written with editorial inputs from Dr Mayank Uppal. He is known for his medical expertise and has a keen interest in hypertension, diabetes and lifestyle diseases.